A house in the woods, a family in need. Two children, alone in front of the harshness of the world, and in the darkness of the woods they become the protagonists of the classic, ancient fairytale that never loses its need to be told, lived and faced. 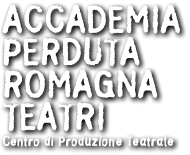 This new work that has been created thanks to the synergy between “Il Baule Volante” and “Accademia Perduta/Romagna Teatri”, continues and concludes the trilogy of the narration started in 2002 with “Il tenace soldatino di stagno e altre storie” (the steadfast tin soldier) and continued in 2005 with “La Bella e la Bestia” (beauty and the beast), both directed by Roberto Anglisani, the most important Italian narrator of Theatre for Children and Young People that, through the weaving invention of a two voiced narration, Anglisani found a new expressive medium both involving and efficient. Through such means a very intense plot is born, filled with meanings and atmospheres, that try to unveil the recondite meanings of events and feelings through words and movement. 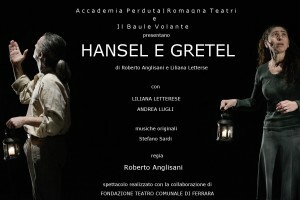 Hansel and Gretel uses, most of all, the methodology of oral narration, wishing to reach the heart of the audience effectively and intensely.